Well, I can't believe we're in October again. But there so many wondrous experiences this year the leaves changing colour, the nights get darker and their just that spooky and mystical charm that only October seems to emit. Oh yeah, and it's Halloween that means it offers a chance to stock up on spooky decor for the year. I was looking in the shops back in August for Halloween decor, I've felt disappointed with the years selection on offer but I've still managed to find some goodies. Also, my partner has pleaded with me to limit how much I purchase as we're running out of places to display for things. I've limited select few items. The allure and temptation to purchase more Halloween treasures have been difficult to resist the urge, but I definitely cope. Like last year, Tk Maxx and their Home Sense Range stocked the most awesome items and it's probably where I've purchased the most stuff. Every year, it seems to stock the best stuff. Usually, I don't like birds but I do like owls and blackbirds. I think its years of my mam and gran having any form of bird decor is bad luck. I was planning to put this in my bathroom but opted for the sitting room. I found this bottle with a crow/ raven I love it an thought it was really in unusually. I loved these picture light frames I've loved them but wanted something a bit more me so, I found this one and had to have it. 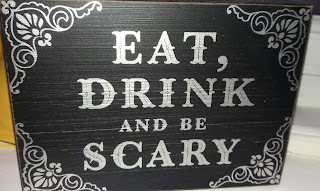 I also found a few wooden signs for the kitchen and bathroom ( I have an appolthicary theme in the bathroom. 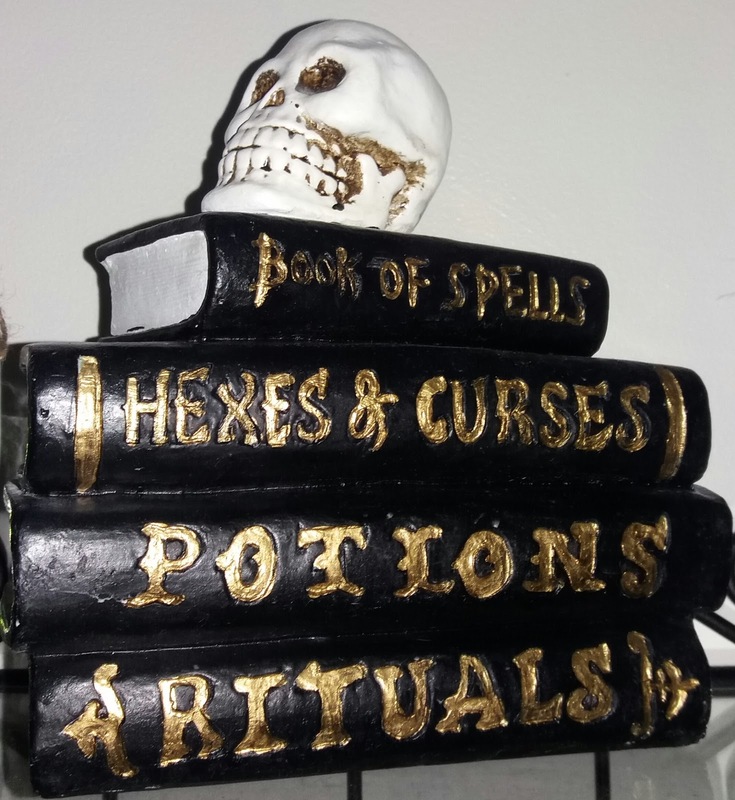 I found these statues with a skull on top of some alchemy books that really enhances the apothecary. 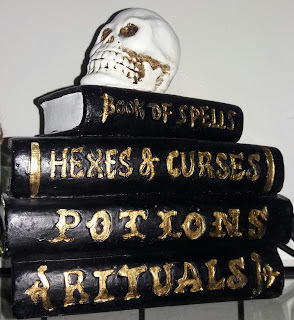 I have this sitting with my potion bottles. 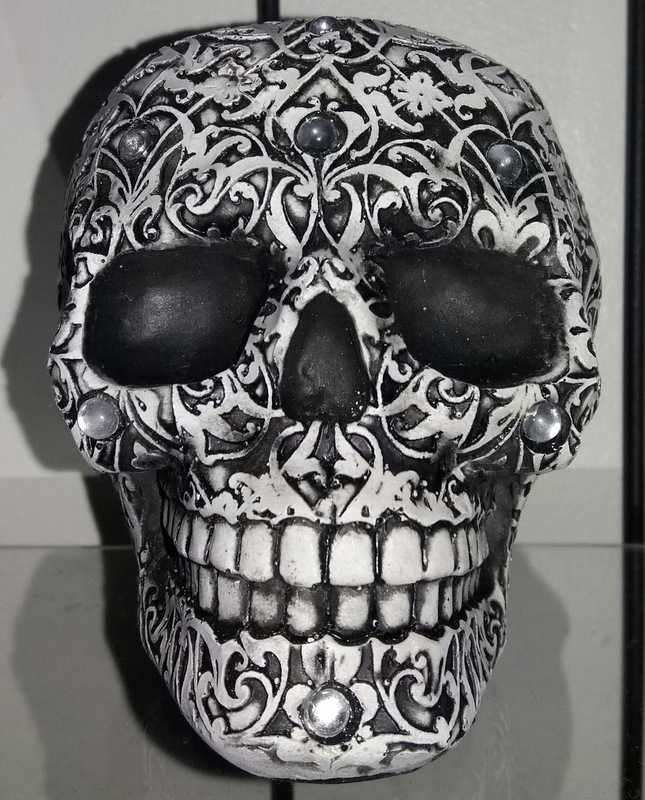 I'm collecting an array of skulls in my bathroom, I found this one thats displaying in my bathroom. 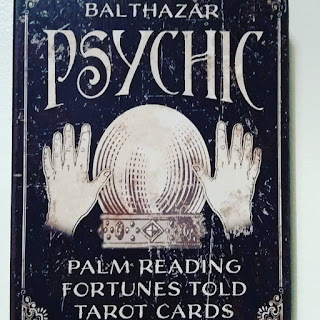 I've love this wooden sign and felt perfect for the kitchen. It has gothic cottage feel. I found these two bowels. I found a Jack Skelleton travel bottle, great as reuseable bottle. From Tiger, I got these two hair clips, I just love them and need to find the right ensemble to wear. them. 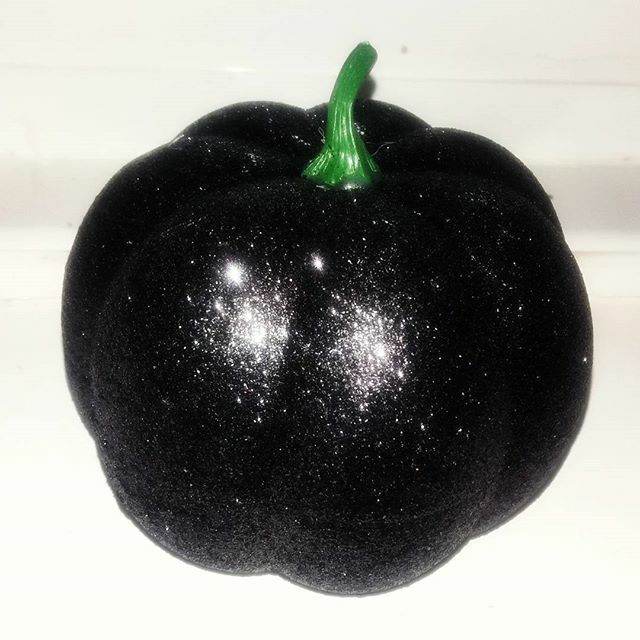 For years, all I've wanted is black sparkly pumpkin and I finally got one from Poundworld. I found this Batty Halloween Bunton in John Lewis it's so cute, it has that Gothic country cottage feeling. 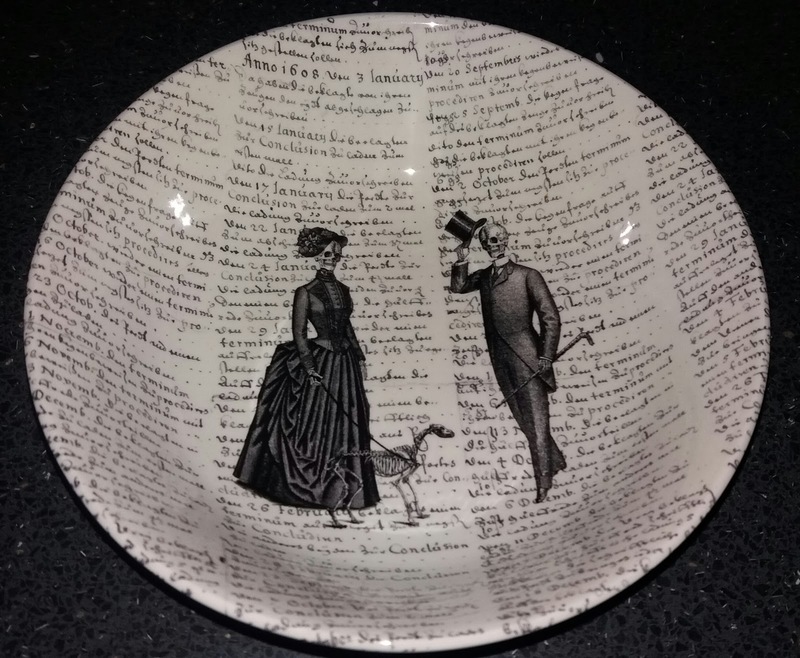 It was on sale for half price, so I only paid £2.50. Its added some excitement to my fireplace. From Poundland I found some goodies. 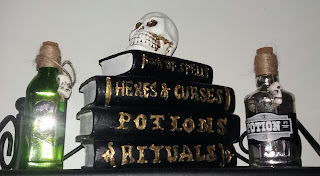 I found two potion bottles that I put on display with the magic books in the bathroom. I'm planning to displaying in craftroom when it gets orgnaised. I saw this last year and never got one, so I was happy to purchase one. I found this owl, I'm still in two minds about purchasing it. Once I'll get my crafting room organised it'll look great. I need to get the room rewired and plastered before I can start using it properly. Even Superdrug had a range of Halloween Makeup, personally, I would use this all year long. A lot the local beauty bloggers have highlighted how amazing the Revolution eyeshadows palettes, but I haven't seen any palettes that appealed to me until now. 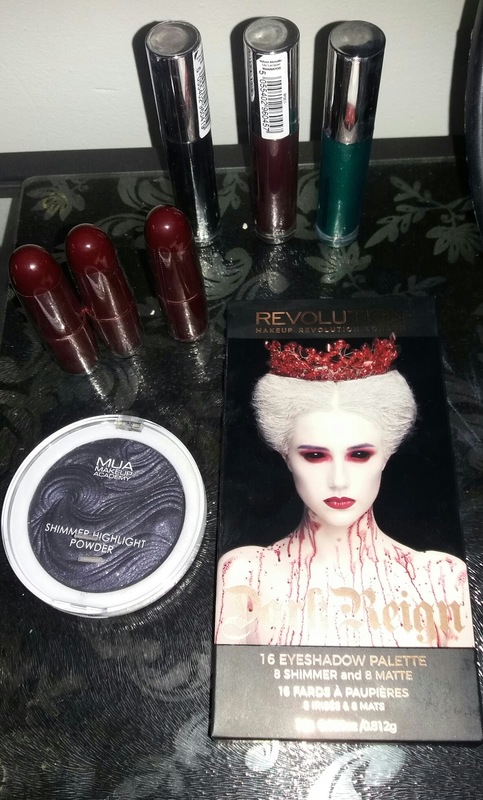 I purchased three of Revolutions lipsticks for £6, a great for a bargain. I bought black sparkly high lighter for curiosity. I purchased three glitter liquid lipsticks in purple, black and green. I actually wore the green one . On Monday I wore it. I was surprised how it lasted around six hours for £3 I can't complain it really exceeded my expectations. 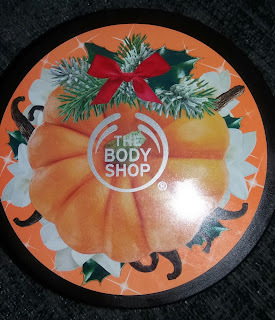 I purchased the limited edition Vanilla and Pumpkin body butter that seems to be perfect for the season and smell delicious. I love old fashioned signs and posters! I’m jealous of those! 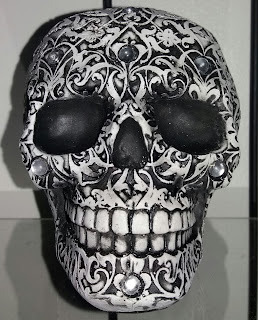 I also love the crow on a skull! Don’t worry, I have a bird and they’re not bad luck! Bites, but not bad luck! Thanks, I was lucky this year with the signs and the dome. I love it all. Lol. Jealous - you have some great finds there. 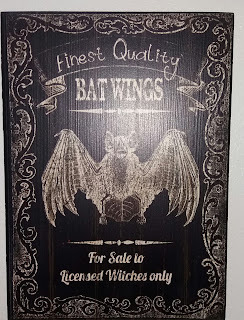 The bat wings sign is very cool. I love the finish on that. 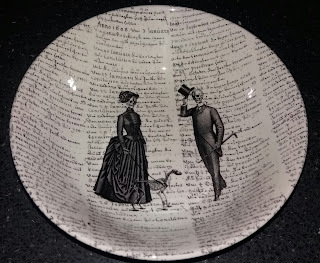 The cloche with the skull and the blackbird is great. And your wallpaper is to die for! Thanks I was happy to find it for chimney breast but 20 pound a roll its a tad expensive todo the entite room. Would a bit too much with the pattern. I think the dome defintly my favourite, the glitter pumkin and eat sign. So many nice things! I really love that bat sign! 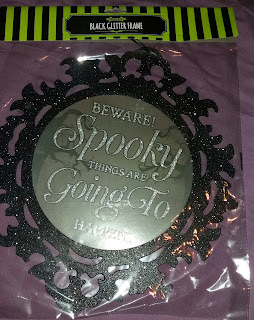 Here we don't have so wide range of halloween items in stores but I have made a couple of good findings anyway! That sounds cool you've at least found a couple of things. About 10 years ago it was very hard to find nice Halloween items. I think since became more popular amongst adults and the mainstream. It meant more avaibilty. 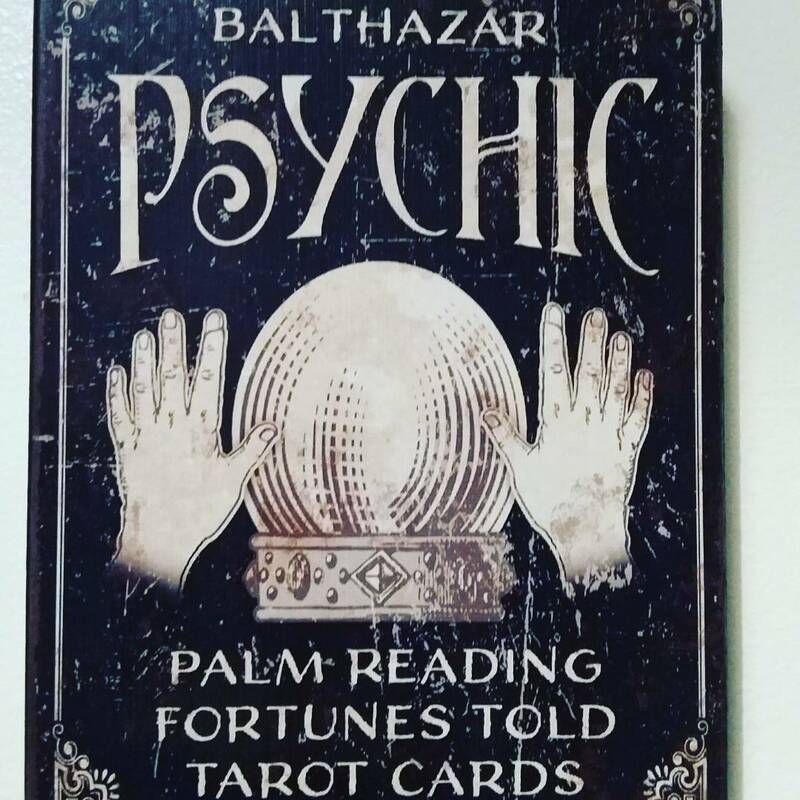 I love spooky, witchy signs! 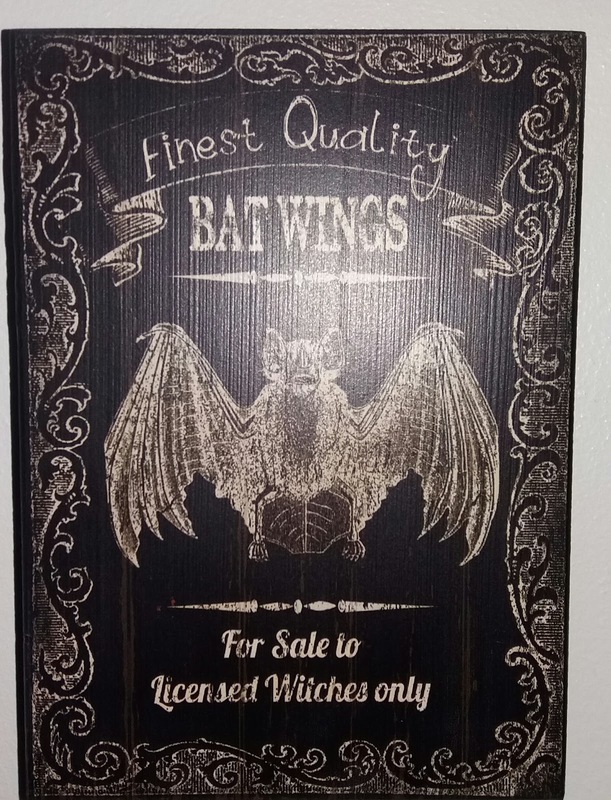 Thanks, they seem to work great in my bathroom and add the spooky feel without being tacky. It is ratherhumerous the bat sign. Thats a shame sometimes that the way. I completely agree with you pumpkins are orange, espcially if you want to eat them. I wouldn't wanna eat black one.But decor wise I love my black sparkly pumpkin. Great finds, and an especially cute Jack bottle! Oh defintly I bought it more to store cool drink incase I go traveling. It was great last weekend and kept my pop rather cold. That sounds exciting. That's interesting how the same companies semem to have different names in different counteries. I love everything you got!! I want it all too! LOL! I can't wait till I have my own space! With my art room and my bedroom, there is only so much I can get right now! Everything looks amazing!!! Big Hugs! Thanks for telling me about the spam. But Yes, I want everything but limited space means I have to learn self control.I think next year, I am going to hide my debit and credit card. Thanks. I was lucky to find them. I've been looking for new thing to put on my walls.It read on other Finnish blogs it seems to difficult to find good quality Halloween items. It's nice you were able to find some Halloween goodies.